The US Supreme Court has declined to hear the broadband industry’s challenge of Obama-era net neutrality rules. The Federal Communications Commission’s 2015 order to impose net neutrality rules and strictly regulate broadband was already reversed by Trump’s pick for FCC chairman, Ajit Pai. But AT&T and broadband industry lobby groups were still trying to overturn court decisions that upheld the FCC order. A win for the broadband industry could have prevented future administrations from imposing a similarly strict set of rules. The Trump administration supported the industry’s case, asking the US Supreme Court to vacate the Obama-era ruling. But the Supreme Court today said it has denied petitions filed by AT&T and broadband lobby groups NCTA, CTIA, USTelecom, and the American Cable Association. Four of nine justices must agree to hear a case, but only three voted to grant the petitions. Chief Justice John Roberts and Justice Brett Kavanaugh recused themselves from the case. Roberts owned stock in AT&T-owned Time Warner, while Kavanaugh took part in the case when he was a judge on the DC Circuit appeals court, Bloomberg Supreme Court Reporter Greg Stohr noted. Kavanaugh dissented from the ruling upholding net neutrality rules in 2017, arguing thatthe rules violate the First Amendment rights of Internet service providers by preventing them from “exercising editorial control” over Internet content. The legal battle over net neutrality will continue and could potentially reach the Supreme Court again in a separate case. The Pai-led FCC is defending its net neutrality repeal against a lawsuit filed by dozens of litigants, including 22 state attorneys general, consumer advocacy groups, and tech companies. 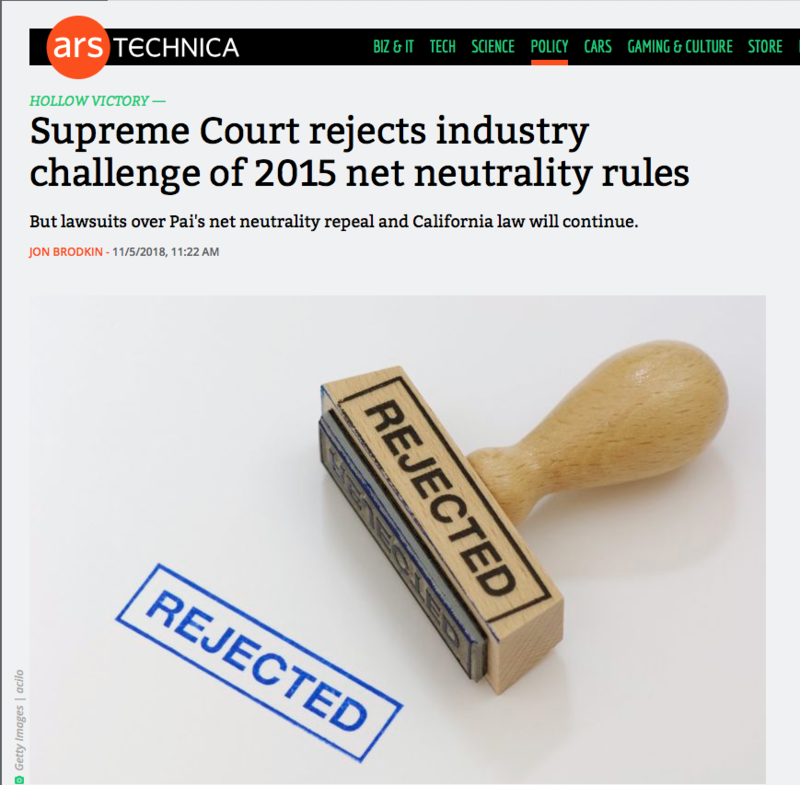 In a related case, California’s decision to impose state-level net neutrality rules is being challenged by the broadband industry and Trump administration. Today’s Supreme Court decision is good news for supporters of net neutrality because it means that the DC Circuit court’s “previous decision upholding both the FCC’s classification of broadband as a telecommunications service, and its rules prohibiting broadband providers from blocking or degrading Internet content, remains in place,” senior counsel John Bergmayer of consumer advocacy group Public Knowledge said. “Much of the current FCC’s argument [against net neutrality] depends on ignoring or contradicting the DC Circuit’s earlier findings, but now that these are firmly established as binding law, the Pai FCC’s case is on even weaker ground than before,” Bergmayer said.